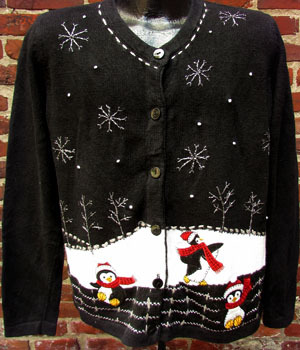 (mens L) Ugly Xmas Cardigan, Penguins playing in the Snow and Sparkly Snowflakes! Home > Ugly Christmas Sweaters > mens MED Ugly Christmas Sweaters > (mens L) Ugly Xmas Cardigan, Penguins playing in the Snow and Sparkly Snowflakes! This Mens Ugly Christmas Cardigan has lil' baby penguins, wearing Santa Hats (With puff balls!) and red scarves, playing about on a winter day as Glittery-Silver and White snowflakes fall from the sky. I think the Black, White and Gray stuff at the bottom is supposed to be ice that their slippin' about on, and the trees in the background are silver and glittery too! Six black plastic buttons down the front. Gray stitching along the collar. One Penguin on the upper back, otherwise back and sleeves are Solid. Ribbed on all the ends. Tagged by White Stag. Ramie/Cotton.